If you like these lessons, we hope you'll become a member of our website. Members have unlimited access to all files on Modern Chalkboard. Student learn about fractions with shapes that are divided into equal parts. First they identify equal parts. 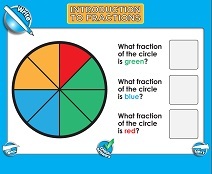 Then they answer questions about basic fractions. Solve the simple word problems by counting objects that are divided into equal groups. This activity is designed to help students learn how multiplication works. 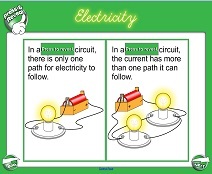 Learn about basic parallel and series circuits, insulators/conductors, power sources, resistors, and switches with this basic electricity lesson. Identify the names of the continents and touch the graphics to reveal the names. Then play the continents trivia game. Look at the weather outside. 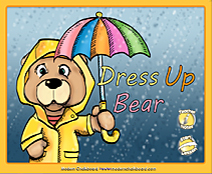 Then dress the bear in the correct clothes. Put on hats, coats, boots, and other accessories. Includes both a boy and a girl bear. You need to be logged in to download this file.